Being in my last year of the Master’s meant I was fast approaching the end of my academic experience. Prior, I had moved from Lisbon to Barcelona to embark in a Renewable Energy Engineering programme which taught me a lot in terms of energy technology, entrepreneurship and innovation. Looking at my path up until then and considering that I have always considered myself a “people’s person”, I was searching for something different for my Master’s Dissertation. In the past years, I grew a deep interest in the start-up world and I knew I wanted to have more experience in that kind of environment. Enter SmartKlub, which had everything I was searching for. From Barcelona, I moved to Oxford to work closer with the founders, understand the dynamics of a start-up and try a new culture. Truly, it was an enriching journey as I went out of my comfort zone and gained confidence in my work and abilities. Both Charles and David were always preoccupied with the development of my thesis. Their availability to answer any question I had and support the progress of the project was constant. Having a regular input from well-seasoned and experienced people from the energy sector gave a great deal of foundations for the project. 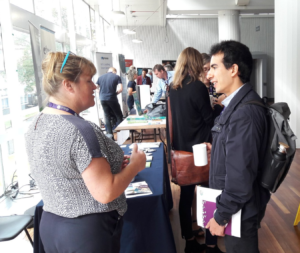 During my time there, I also attended relevant events which helped me gain more knowledge about the topic of Community Energy and network with people from energy companies: the OxLEP workshop in Oxford, the Community Energy Conference in Manchester and the Smart Cities Conference in Lisbon. I aimed at making an analysis of attitudes and behaviours of Community Energy stakeholders – energy services providers, energy groups and communities, householders and SMEs. This implied conducting several interviews with people from all kind of positions, companies and backgrounds. This proved to be where I had the most to learn from: understanding the needs of an end-user, their profiles, how to communicate with different groups and how to absorse their input in order to deliver a better service. Product Development: the focus was on understand the needs of the market SmartKlub acts in. As we run online surveys and interviewed people, we were able to shape the services we aimed to provide. I learned new techniques to define personas (user research) and, most importantly, how to ask the right questions. In addition, I was constantly doing a market analysis in order to get as much information as possible. Business Development support: helped in the preparation of bids and applying for funding. With this experience, I fostered my ability to take the initiative, ask the right questions and not be afraid of trying new methods and working styles. As I gained more confidence in my skills, I am currently on the verge of starting my own business. With that being said, I can only thank SmartKlub for showing me the support I was always needed and placing trust in my work.